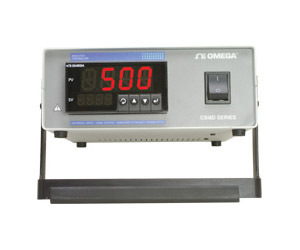 The OMEGA™ CSi8D is a 1/8 DIN size (96 x 48 mm) Digital Panel Controller in a rugged benchtop metal enclosure featuring the big iSeries color-changing display. The digits are twice the size of typical 1/8 DIN panel meters. The iSeries meters feature the only LED displays that can be programmed to change color between GREEN, AMBER, and RED at any set point or alarm point. Other options include, serial communications, Modbus and Ethernet. The UNIVERSAL TEMPERATURE & PROCESS instrument (model “i”) handles ten common types of Thermocouples, multiple RTD’s, and several Process (DC) Voltage and Current ranges. Units can be re-configured in the field. The OMEGA™ iSeries devices can connect directly to an Ethernet network with a standard RJ-45 connector and can send and receive data in standard TCP/IP packets. (Please specify EI or C4EI option.) The iSeries devices can serve Web pages over an Ethernet LAN or even over the Internet making it possible to monitor and control a process through a web browser (such as Microsoft Internet Explorer) from anywhere in the facility or anywhere in the world. In fact, the iSeries controller can even send an email to the engineer or anyone they choose) alerting them to an alarm condition or updating the status. Leveraging the technology of the Internet, the engineer could receive a message from the iSeries controller on an Internet enabled pager or cell phone. Most remarkable is that all this can be accomplished without a computer. The OMEGA™ iSeries device (meter or controller) connects directly to the Ethernet Network — not to the serial port of a computer functioning as a “server” and “master” to “slave” instruments connected through serial communications. The iSeries devices are also available with RS-232, RS-422, RS-485 and MODBUS serial communications. Specify the C24 option.) In fact, the iSeries are the first instruments of this type which include all these serial protocols on one device, selectable from a menu. With the EI option, these 1/8 DIN instruments are stand-alone Web Servers. The Ethernet and Web Server capability is actually embedded in the device. (The smallest 1/32 DIN size device must be connected to an external iServer.) The OMEGA™ iSeries device is assigned an IP address on the network and can also be assigned an easily remembered name such as “Heater1”. In fact, the device could be assigned an authorized Internet IP address from an Internet Service Provider and function as a World Wide Web Server delivering whatever specific information is called for. (For an example, please see www.newportUS.com/iserver) The iSeries devices work well with conventional industrial automation, data acquisition and control programs as well as Microsoft Visual Basic and Excel. OMEGA™ provides free software and demos which makes it fast and easy to get up and running with many applications. 참고: Each CSi8DH Series benchtop controller comes complete with 2 output cords, 1 main power cord (POWER CORD-MOLDED) and complete operators manual. Models with communications option(s) include a cable for connection to your PC.